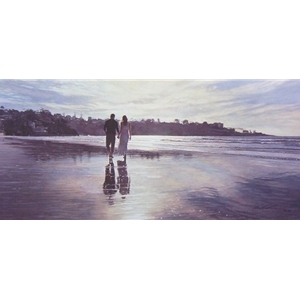 Hold on to Your Dreams by Steve Hanks from Prickly Pear Galleries. This embodies a universal longing for companionship. This newly married couple are dreaming of their life together. There are no birds flying, all the birds grounded, just as this couple should be. Beyond the birds there is a child, perhaps the one of their future children. In the far distance, there are grandparents with their children and grandchildren, a vision of their life in the future.